The Smithsonian National Air and Space Museum located at the National Mall is a great place to visit when on a family vacation to Washington DC. It is located on the southeast of the Mall across from the National Gallery, next to the Museum of the American Indian, not too far down from the Capitol building. Your family will get see truly historical items such as the Spirit of St. Louis and the Wright Brothers first plane to fly. They'll also get to touch a moon rock. Now that's something your kids will remember. What is there to see at the National Air and Space Museum? How Things Fly - Perhaps the number one exhibition to see with your kids, this interactive exhibition is full of wonderful hands on activities that are great fun for the family to do together. Run experiments to see how gravity, air forces, wind, and more all help to keep planes in the air and under control. Kids jump inside the cockpit of a plane and check out the controls a pilot needs to fly. Space Race - See missiles, rockets, a space station, and a model of the Hubble Telescope. History of the Space Race of the Cold War. Early Flight - See some of the earliest attempts to fly here from a Hang-Glider built in 1894 to the first military airplane built by Orville Wright. Ask your kids if they want to fly home on one of these flyers! 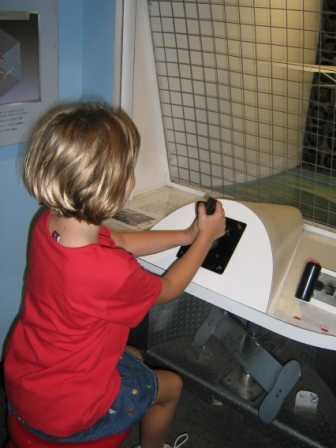 Milestones of Flight - When your family first enters the museum, you will enter the Milestones of Flight gallery. This has an impressive number of historical artifacts throughout the history of flight and space travel. These include the Spirit of St. Louis, Sputnik 1 (the first artificial satellite), the Apollo 11 module (first man on the moon), Space ShipOne, and more. What else is there to do at the National Air and Space Museum? IMAX Theater - A great place to give your feet a break and catch a breathtaking 3D visit to the stars. Albert Einstein Planetarium - Take another break here. Very interesting and cool for kids and family. There are a few different shows including a free one for younger kids with Big Bird. Be sure to check the times and plan ahead. How long to I need here? This depends a lot on your family, kids, and interests. You can easily spend an hour or three going through the exhibits. If your kids like the interactive experiments, you could take an hour in that exhibit alone. All in all, if you plan to see everything, catch an IMAX movie, and grab a bite to eat, you should plan on half a day or so. 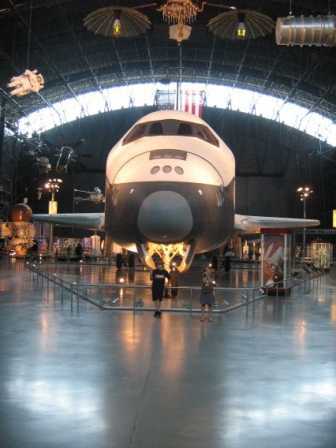 Not as well known and located away from downtown Washington DC near Dulles Airport is the Uvar-Hazy Air and Space Museum. If you want to venture out of downtown, this is well worth seeing. The focus is on larger airplanes, helicopters, rockets, and space vehicles; a truly amazing collection of hundreds of spacecraft. Some of our families favorites were the Space Shuttle (full size! ), a Concord jet, an SR-71 Blackbird, and the Enola Gay.